In March 2016 the Nigerian Communications Commission (NCC) published a consultation paper on the Procedures and Guidelines for the future provision of Value Added Services in Nigeria. Its goal is to make sure that consumers are properly protected. The proposals were broad, impacting all stakeholders directly and included the introduction of a new structure for the VAS value chain, new revenue models, proposals related specifically to the activities of the mobile operators as well as attempts to address the issue of unauthorised billing and delivery of unsolicited SMS, which is currently a big problem in Nigeria. highlighting best practice and experiences from other markets. It recommends that positive engagement and full industry collaboration is the best way to proceed with any new regulation in order to create an effective regulatory regime that will protect consumers from harm, but one that will also enable the market to continue to develop and grow, to the benefit of the wider Nigerian economy. Here, we take a deeper look at the proposal which could have a significant impact on future mobile ecosystem in this key African market.. The NCC was established by the Nigerian Federal Government as an independent regulatory authority for the telecommunications industry in Nigeria. The Nigerian Communications Act (NCA) also confers on the NCC the responsibility to control and regulate other related services offered in addition to the basic voice communications; these include data services, Internet and other value added services. The NCC has up to this time allowed the value added services industry to develop without any encumbrance or significant regulatory interference. The VAS industry in Nigeria has grown into a multi-billion Naira industry and become an enabling tool for facilitating efficient operations in other sectors of the economy. The Commission cites having received several complaints from the public in respect of service providers who use short codes assigned for value added services to perpetuate fraud, the menace of unsolicited text messages that flood customers’ phones, fake bank credit alerts and anti-competitive activities. As such the Commission is now of the opinion that it is time to regulate the industry in order to protect, balance and reconcile stakeholders’ interests and has developed a set of regulatory guidelines and opened a public consultation. The consultation includes three key areas and covers a wide range of proposals that have a direct impact on the providers of VAS services as well as mobile messaging. Specific functions and responsibilities assigned to each party as well as restrictions on the provision of certain types of services by some parties [e.g. only operators are allowed to provide ringtones, callback ringtones, Cell-ID dependent locations based services. Development of a code of practice for consumers which would cover service information, complaints handling, T&Cs etc. 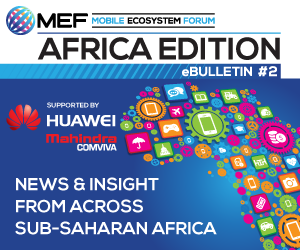 Supported by Huawei and Mahindra Comviva, download our quarterly eBulletin for insight into the African mobile ecosystem with news and market data from across the continent. Previous PostFacebook Local Awareness Adverts – Not quite closing the loop!